The domain industry is up in arms, as revelations about its very core have made the news. According to investigative resources, domain corporations, registrars, registries and ICANN itself, is controlled by the Illuminati – an elite group of enlightened brotherhood officials that dictates the course of things in domaining. 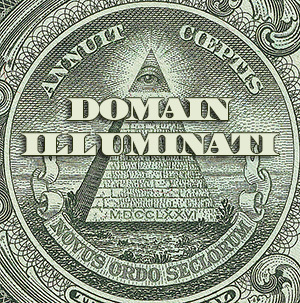 “Every decision, from which domains drop, to who gets the best gTLDs when they are auctioned off, is made by the Illuminati Trinity, the very top of the brotherhood,” added Maximus. The Illuminati members are from the US, Europe, Asia, Africa, Central & South America and Oceania; some members are from Hyperborea and Domainistan. By controlling the media and the financial system behind gTLD allocation, the Illuminati are managing resources exceeding $2 trillion dollars, along with all the world’s TLDs, ccTLDs and gTLDs. These serious allegations require extensive research; if you have any solid information about the Domain Illuminati, send it our way. Really? I was at domain meetup last Friday, some some people there did look like the illuminati although I have no idea what they look elioe xactly. First, I thought of Frank Schilling. Then, Jason the organizer. I want to ask Frank but he might not talk to me. Jason, I’m afraid to ask. He’s a little skary just to talk to lol. Maybe he affiliated with iconn. OK, OK ok.. I confess! You are in the domaingang land. Who knows more about domain illimaniti than the domain gang? Now it makes me wonder why namescan is held in Vegas. Is there any connection? RaTHeaD – The Illuminati eye belongs to George Washington, father of the $1 dollar bill. He was a little on the chunky side. Hmmm so this would explain alot! Is this why I could never get the good .com drops! ?